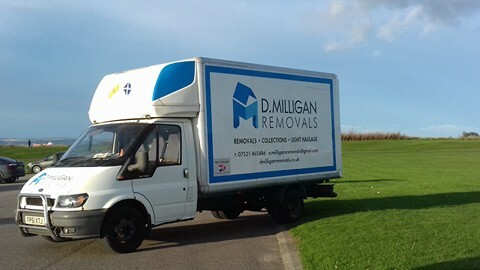 Welcome to D. Milligan Removals Ltd, a small family run removal and delivery company, based in Nairn but covering the Highlands. We provide first class services, all born from one man and his van. We value customer service, communication and local service to ensure that we are a company you'd always consider recommending. We are fully insured house movers so that in the unlikely event something goes wrong you can rest assured that we've got you covered. We're professional removers having tackled hundreds of homes, offices and businesses so there's very little in the way of obstacles we haven't encountered. We come fully prepared to every job to dismantle, adapt and work our way through any situation. Our goal on each removal job is to guarantee the smooth sailing, minimise your stress (as moving is already stressful enough). We work closely with storage providers, international shippers and local tradesmen and so can guide more abstract project and removals through our extensive professional network. Moving house is costly which is why we try to offer some of the most competitive removal rates in the Highlands. We are professionals, we've seen it all. Leave those tricky lifts, tight spaces and awkward carries to us to figure out. We take every precaution but in the unlikely event there's an accident we've got you covered. We care about providing a great service. We will always strive to ensure you are 100% happy. We offer one of the most competitive rates in the Highlands! Give us a call and we’ll happily come round to provide a free quote for your removal project, collection or drop-off. The guys turned up on time and just cracked on with it. They were fantastic. Nice and quick and professional.